Fall is the harvest season in Utah, and a tasty opportunity for a getaway is to drive up and down Highway 89 just south of Brigham City—aka Utah’s Fruit Highway—to find every kind of crop that’s being hauled in. 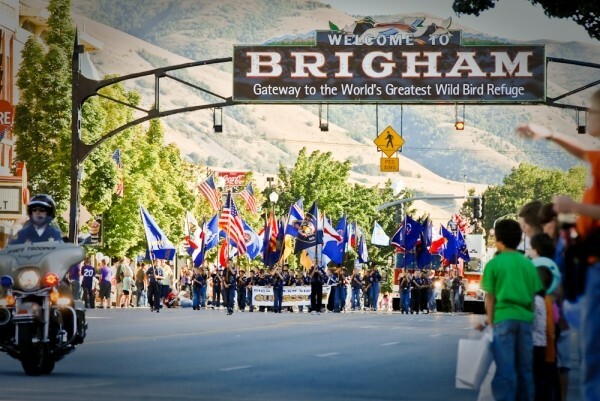 Brigham City, just about an hour from Salt Lake City, even pays tribute to the harvest with Peach Days, coming up Sept. 4-7 (Brigham City Main Street, 435-723-3931, BCAreaChamber.com). While Brigham City is certainly worth the drive for the fresh produce, it’s also a fun getaway with unique outdoor recreation, interesting culture and classic dining. You’ll also get to see the famous arch over Main Street announcing the town as “Gateway to the World’s Greatest Wild Bird Refuge.” That arch was also the site of a classic Budweiser commercial made in 1992. Check it out on YouTube—and sorry, but no, Brigham City does not really have the world’s tallest beer cooler. The fruit stands that line Highway 89 in Perry and Willard just south of Brigham City are particularly full in fall. Tagge’s Famous Fruit (3431 S. Highway 89, Perry, 801-755-8031, TaggesFamousFruit.com) and Paul’s Patch (1894 S. Highway 89, Perry, 435-723-7159) feature peaches and many other types of produce. At Pettingill’s Fruit Farm (8815 S. Highway 89, Willard, 801-782-8001) you can even pick a piece of fruit and have them mix it into a fresh shake. A new addition is Cake Farm (801-389-6111, next to the Maverik at 2241 S. Highway 89, Perry), an offshoot of Vintage Cupcake Co. in Ogden (110 25th St., 801-621-1336, Facebook.com/VintageCupcakeCo), which serves up moist cupcakes in unique flavors. Brigham City is a great jumping-off point for a number of adventures in the surrounding mountains, but the area is best known for the Bear River Migratory Bird Refuge (Exit 363 off Interstate 15, 435-723-5887, FWS.gov/refuge/bear_river_migratory_bird_refuge/), which is just five minutes outside of Brigham City, with 250 different species of birds migrating to the 88,000 acres of protected habitat. There is a half-mile walking trail, as well as a 12-mile loop that can be traveled by bike or auto. The transcontinental railroad was completed at Promontory Summit, just a 45-minute drive from Brigham City, on May 10, 1869. When the Utah commemorative U.S. quarter came out in 2007, the historic meeting of East and West was the image chosen to represent the state. You can stand in the very spot where the famous four golden spikes were driven at Golden Spike National Historic Site (32 miles west of Brigham City, Highway 83, 435-471-2209, NPS.gov/gosp/index.htm) between replicas of the Jupiter and No. 119 trains that were there that day. Traveling north out of town to Bothwell, near Tremonton, Marble Park (11150 W. 11200 North, Bothwell, 435-854-3618) is an amazing piece of folk art. Named after the local farming family that created and owns it, the park is a combination of metal sculptures, playground equipment and what can best be described as “contraptions.” The urge to sit back and admire everything is exceeded only by the urge to play on it. Even though it’s on private land, it’s all been left out in the open for people to stop by and enjoy. Starting Sept. 6, the Brigham City Art Museum (24 N. 300 West, 435-226-1439, BrighamCity.utah.gov/museum.htm) will display paintings, drawings and photos from the Utah Plein Air 2013 Juried Art Competition. Artists were given a certain amount of time to produce a work in the outdoors. Maddox Ranch House (1900 S. Highway 89, Perry, 435-723-8545, MaddoxFineFood.com) has been in the same gigantic location since 1949. Besides gargantuan steaks such as a 1-pound ribeye or a 24-ounce T-bone, Maddox is known for its bison steaks, fried chicken and “turkey steak.” If you want a variety of the many offerings on the menu, try the “taste of Maddox,” which comes with fried chicken, turkey steak and chicken-fried steak. Options along Main Street in Brigham City include Peach City (306 N. Main, 435-723-3923, ThePeachCity.com), a drive-thru that has been serving burgers, fries and 25 flavors of housemade ice cream since 1937. At Idle Isle Cafe (21 S. Main, 435-734-2468), don’t miss out on the chocolate shakes and the “chef’s special”: hot rolls stuffed with roast beef, cheese, pickles and onions and served with a side of Utah’s own obsession, ranch dressing. Visit Brigham City during the harvest season for the peaches—and while you’re there, soak up some history, enjoy the outdoors and taste the local food. Kathleen Curry and Geoff Griffin write about their treks near and far for City Weekly and host The Travel Brigade Show podcast.